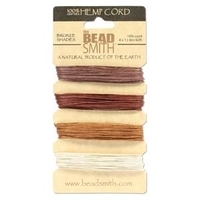 Beading with natural fibers has never gone out of vogue. 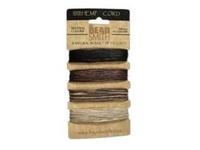 Hemp twine is a classic favorite in macramé designs. 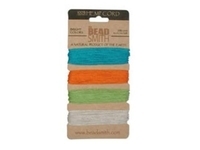 Because of the great selection of colors and sizes available today, hemp has become a popular component of Kumihimo, micro-macramé, wrap bracelet and knotted jewelry designs. 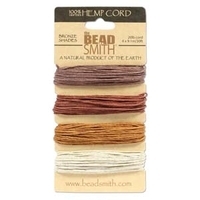 Hemp is one of the fun go-to fibers when it comes to large-hole beads, and nothing else looks like natural hemp. Choose from 4-color cards in .55mm 10 lb. test and 1mm 20 lb. test sizes We also have a natural 4-size card with 10, 20, 36 & 48 lb. test twine.